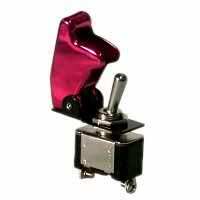 Want to install one of these Toggle Switches? A toggle switch is an electrical component that controls the flow of electricity through a circuit by means of a mechanical lever that is manually controlled. There’s several varieties of toggle switches, but basically, they’re essentially on-off switches for whatever circuit they’re wired to. Usually, toggle switches are installed in devices that lack a pre-existing means for regulating an add-on’s operation. Eg. 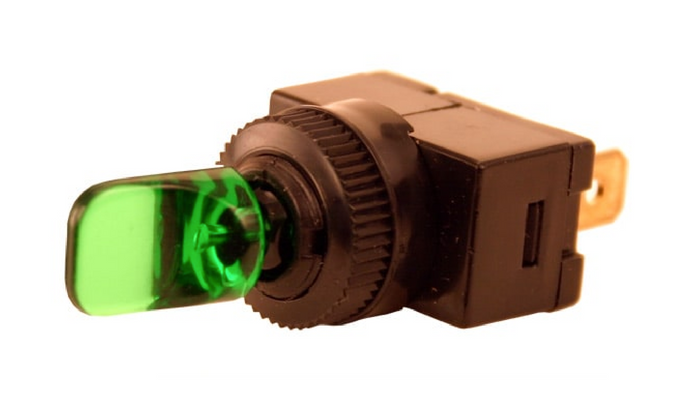 someone might install a toggle switch in their vehicle to operate a motor vehicle’s interior LED light system or for their AMP. You can cut the remote AMP turn on wire, not the main power wire. Then connect each half of the cut remote wire to each of the 2 connections on a toggle switch. Regardless of where the amp is getting it’s remote turn on voltage, this will allow you to turn the amp off while still playing the radio. you just need to hook your data (usually blue) wire from your amp to it. Then run power to your switch and ground it. Put an inline fuse on your data cable if you want. ok yea, thats prolly where i messed up at. i just ran the blue wire and never put power to the switch or anything. ah! Why would you need power to the switch? He doesn’t need power to the switch unless its a light up style. What you did the first time should have worked. Basically the switch runs inline with the data wire from the deck to the amp. In the off position no signal gets to the amp for it to turn on. Sounds like maybe the switch just wouldn’t handle the current going thru the wire. What I did was use the remote wire from the cd player and ran that to the power side of the switch and then ran the other side of the switch to the remote connection on the amp…everything has been working fine…. yea i thought it would work too. i dunno, the switch i bought said it was a 10amp switch. i guess thats not enough. but the biggest switch i could find only went up to 450watts, and i have a 1000watt amp. So the amp turns on? I was doing it thinking he wanted to NOT hook the switch to the remote of the HU. ok all i wanna do is use the switch to turn on my amp instead of using my deck to turn it on. cause i dont wanna go through all the menus on my deck to turn my woofers on. i just wanna flip a switch! Ideally and in most all applications I have ever heard of you put a switch (2 prong) inline with the remote turn on wire (normally blue). In the OFF position there is no signal to tell the amp to turn on. In the ON position the signal travels down the wire normally as if there was no switch. The amperage/wattage of your amp does not effect what kind of switch you need. As bad venge said, there isn’t much current going thru the remote turn on wire. Most times (if wired right) the amp will turn on with the HU and shut off with the HU. If you hook the blue wire for the amp to constant power, the amp will be on all the time– instead hook the blue wire to the back of the HU labeled remote. Then you do want to bypass the headunit’s remote wire. Run a wire from the battery, or tap into an existing 12v constant source, and put your switch inline on that. Just be sure you always turn the switch off when you leave the car, or else your amp will stay on until the battery dies! ill just try the normal way i did before. So you’re just going to ignore good advice and possibly start your car on fire? Hah! Find a constant 12v power source in your car (you can get some good advice for doing that here), run that wire to your switch, then run a wire from your switch to your remote input on the amp. Ignore the head unit’s remote wire (tape it off cause it’ll still be live sometimes). ok so what i did was i ran a wire from a constant 12v and crossed it with the blue wire coming out of my amp, and i put those to the ON prong of the switch. then i took the other half of the blue wire that was coming out of my HU and put it on the OFF prong of the switch? am i good?? it works fine. The constant 12volt is unnecessary if you are retaining the blue remote wire…all you had to do was switch the blue wire. A switch is like a valve, it takes something into one prong, and sends it out the other. If the switch is turned off it breaks the connection and doesn’t send anything out the other prong. The remote wire doesn’t change your bass settings or sub settings. The RCA’s tell the amp what to do. Blue is the remote wire. 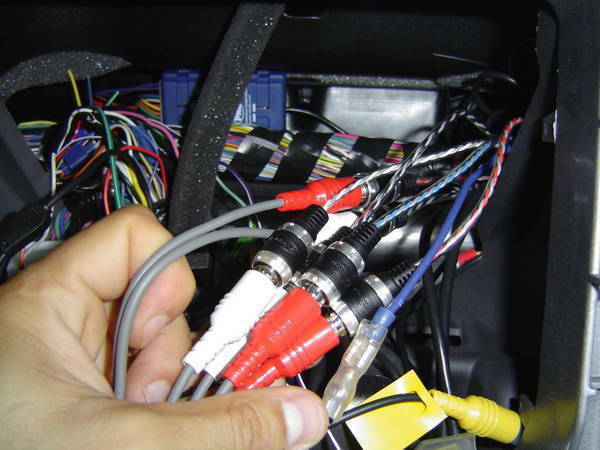 All you have to do is out a switch in series with your remote wire that runs from your head unit to your amp(s). I di this so I can turn off my subs when my kids are in the car and it worked flawlessly.